MANILA, Philippines – The 2015 PBA All-Star Weekend finally kicked-off on Friday, March 6 at Puerto Princesa Coliseum in Palawan City. The stellar event started at 4:15pm with Obstacle Challenge. 2014 Champion Mark Andy Barroca of Purefoods Star Hotshots was eliminated too early in the first round. Barocca finished the obstacle in 38 seconds which is enough for him to let go of his Title and hand it over to a new Champion. Like many of the contestants, the ex-Tamaraw struggled at the 3-point station which became the former champion’s fall. Chris Banchero topped the first round with a quick 28 seconds followed by San Miguel Beermen 3rd-string Point Guard Jeric Fortuna and 4-Time Obstacle Champion NLEX Road Warrior Guard Jonas Villanueva with 32 and 34 seconds respectively to qualify to the final round. The Fil-Italian Alaska Aces Guard who had a near flawless round one had an off-night at the 3-point station and finished the obstacle in 45 seconds. Jonas Villanueva automatically disqualified Banchero in the Final round when he recorded 37.7 seconds. But the seldom used SMB Point Guard stunned the Veteran Villanueva and denied him to win his 5th title when finished 5-second faster than the NLEX Shooting Guard. Fortuna won the 2015 Obstacle Challenge and Php60, 000 richer now. Just like Mark Barroca, Mark Macapagal of Meralco Bolts also handed over his title to the new 3-Point Shootout Champion. The former 3-point king came out very relax, poised and confident that he will retain his belt. But he was also eliminated in the opening round by Barako Bull JC Intal who set the bar so high with 18 big points and veteran “Big Game” James Yap and young gun Batang Pier Terrence Romeo joined him onto the Final Round with 18 points as well. Jimmy “Mighty Mouse” Alapag who recently called it a career before the start of the All-Filipino Cup also participated in 3-point shootout but fell short to qualify for the next round. Alapag was so grateful to Commissioner Chito Salud and PBA Governors for allowing him to play for his very last All-Star Game. Intal, Yap and Romeo who all had 18 points in the elimination round, battled it all out for the vacant crown. JC Intal started the final round but made only 11 points while Sophomore Shooting Guard Terrence Romeo who is now the 3-point King proved the fans and his co-players that he is the real deal by listing 16 points to secure the title. James Yap had a chance to tie the younger Romeo’s 16 markers but got beaten by the clock and wasn’t able to drop the money ball for the equalizer. While the Obstacle Challenge and 3-Point Shootout were surprisingly dominated by the Sophomore Guards, the Slam Dunk Contest Trophy was successfully defended by “Papa” Rey Guevarra against Ginebra Gin Kings Power Forward, the high-leaping Japeth Aguilar in the Finals. 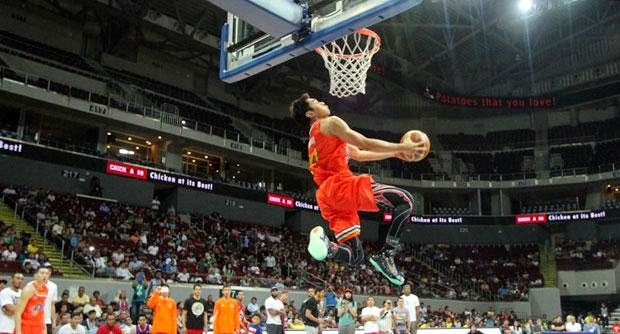 The Annual Dunk Contest brought the house down by 5 of PBA’s most talented dunkers. After the 3-point shootout, JC Intal didn’t have the time to change his jersey and immediately showed his dunking arsenal with a baseline windmill jam and earning 45 points from the judges. Japeth Aguilar frog-leaped over Kevin Alas for a two-handed Gorilla Dunk which impressed the judges and gave him the 1st 50 points of the contest. Rookie Fil-Am Forward Matt Ganuelas-Rosser of Talk ‘N Text imitate Andre Iguodala with a back-of-the-board pass from Kevin Alas resulting to a pumped dunk with a 46-point grade. Defending Champion Rey Guevarra simply made a 360 Dunk which good for 45 points. His co-champion, Justin Melton, ran out of time and decided to dunk with a blind fold but failed to complete it and enough for him to lose the chance to make a back-to-back. Melton redeemed himself on the 2nd round with left hand throw down with the help of fellow Fil-Am Stanley Pringle which he earned 44. But because of his failed dunk attempt on the 1st round, he fell short in advancing to the final round. Japeth Aguilar earned his ticket to the finals when he posted a Ginebra Sticker high above the glass by tapping it with a left hand and slamming the ball on the rim with his right. Rey Guevarra completed the 2nd round with a Windmill dunk and showing his love for the Palawenos with an “I Love PALAWAN” shirt which is good for 48 points to advance to the final showdown with Japeth Aguilar. The 2 finalists dunked it off: Aguilar did a windmill slam off the glass in the 1st round of their dunk duel and dunking over Kevin Alas in the 2nd round tallying a high score of 97 for 2 rounds. Guevarra tried and successfully jumped over Reynel Hugnatan on a stool which gave him 49 points. He needed another 49 points to win the dunk-off but his two-handed jam assisted by very nervous Simon Atkins only gave him 48 points and tied with Japeth’s 97. The two dunkers were given one more dunk each to break the tie. Japeth Aguilar jumped on the free throw lane ala Michael Jordan but the Judges were not so impressed and only gave him 46. Rey Guevarra positioned at the left side of the court and took off from baseline for a between the legs dunk which sealed the deal and defended his crown. The highlight of PBA All-Star Friday made the jam-packed crowd so happy and jumping off their seats with the Rookies headed by the 1st over-all draft pick Fil-Am Stanley Pringle walloped the Sophomores 150-131. There were too many spectacular plays made by show time youngsters but Pringle’s alley-oop dunk from fellow rookie Chris Banchero is the highlight of the game. Slam Dunks are good for three points at any All-Star game so Rookie Matt Ganuelas-Rosser and Sophomore Center Raymond Almazan made at least 5 dunks apiece and wowed the crowd. RR Garcia, Terrence Romeo and Kevin alas joined the slam dunk extravaganza with the help of their teammates who lifted them to the rim and made the dunks of their lives and sent the crowd home well entertained.